There is nothing more eye-opening than becoming a parent. The moment you find out that you are pregnant, it is as if you realize just how dangerous everything is that surrounds you. That soap? Toxic. That packaged food? Poison. The microwave? Death. Suddenly, you throw yourself into learning about the healthiest, safest items possible. This little life you are growing will enter the world completely perfect, and you want to provide an environment full of safe items and positive experiences. There are enough uncontrollable toxins flying around to worry about, make sure that the things you bring into your home don’t add to the list. One of the biggest fears most new parents experience is SIDS. It is terrifying because the cause has not yet been determined; although, we can look at a pattern of toxic exposures in relation to SIDS occurrences and form our own opinions. While keeping your baby in your room is highly recommended, one thing that is often not talked about is the quality of your baby’s mattress. Toxic chemicals are found in the materials used to make the most commonly sold crib mattresses (and all mattresses for that matter!). Did you ever even think that a mattress could be dangerous? All crib mattresses have the same overall construction: the core, the padding, flame retardant material/chemicals, and a cover or “ticking,” which may also have chemicals added to make it waterproof. Crib mattresses range from those made almost entirely of petroleum–based products (petroleum = SCARY dangerous) to others made of natural fibers like wool or cotton. 72% of surveyed mattress models use one or more chemicals of concern identified in this report, such as antimony, vinyl, polyurethane, and other volatile organic compounds. 22% use proprietary formulas for waterproofers, flame retardants or antibacterials, keeping potential health impacts secret. 20% of surveyed mattresses offer some “green” components but do not take meaningful steps to ensure products are free of toxic chemicals. Some flame retardants are made with antimony, which is also a contaminant of polyester. Long-term inhalation of low levels is linked to eye irritation and heart and lung problems. Vinyl, used as a waterproof cover, relies on many toxic chemicals throughout its production, including cancer-causing chemicals, asthma triggers, and developmental toxins. Polyurethane foam, also appearing as “memory foam” or “soy foam,” is made with a potentially cancer-causing chemical, and may emit harmful “VOCs”—volatile organic compounds—in the home. VOC’s can also be found in synthetic latex foam. VOC’s can irritate eyes, nose and throat, cause headaches and some cause cancer. Companies that use proprietary chemicals, or refuse to disclose chemical use, make it impossible to determine potential health threats. In the absence of disclosure, assume they may cause harm. What brand mattress should you go with? This information is also relevant for all mattresses, not jus crib mattresses. Take the time to research before you purchase and air your mattress out for at least a week before using it! 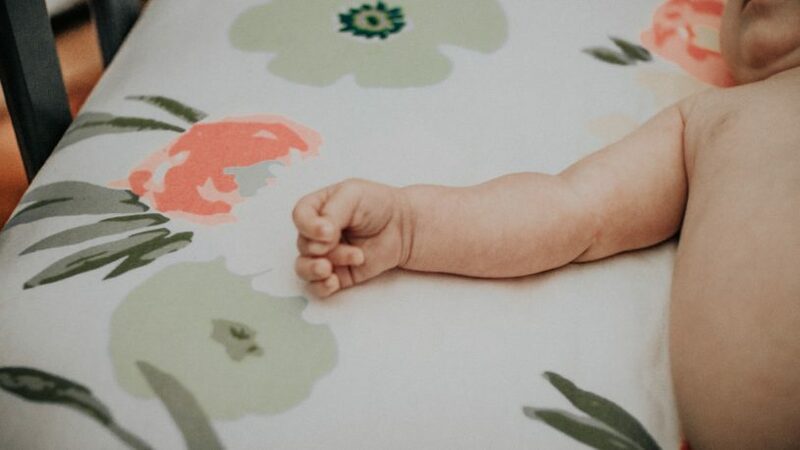 Breech births occur in approximately 1 in 25 full-term births, but this statistic is drastically skewed due to the number of mothers who opt for an elective c-section between gestational weeks 37-40 due to their baby’s position. As a family chiropractor, I see many mothers throughout their pregnancies. I cannot begin to count to number of women who begin to worry about a baby who is sitting in a breech position. The first thing that I remind them is that there is still time! Until labor actually begins, and even throughout early labor, there is time for a baby to change positions. However, I completely understand the state of panic as the weeks fly by and a baby remains in a less than ideal position. I will cover all of the ins and outs of the Webster Technique and how chiropractors can aid in helping a pregnancy be as uneventful as possible in another post, but today I want to break down breech positioning and the options you have as the mother. To begin, there are several positions in which a fetus can become situated in utero; the most common being head down in an either left or right occipital anterior position. 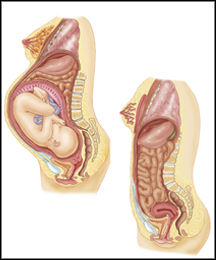 This means that the baby’s back is facing the mother’s abdomen (complete OA position) or is turned slightly with the back facing the left or right side of the mother and the head looking the other direction. These are commonly referred to as LOA and ROA positions (Left or Right OA). While these are the most common and easiest to birth positions, there are several other options a baby may choose. A transverse, or side-lying baby is the only position in which is truly unsafe to birth. It can possibly be fatal for both baby and mother; however, a c-section does not need to be scheduled, as a baby can turn once labor begins. When the body begins labor, different hormones are released and both mother and baby work together. This can encourage the baby to turn head down. If baby’s position does not turn as the labor progresses, a c-section will be needed. • Frank (or extended) breech—legs are straight and feet are up near the baby’s head. • Complete (or flexed) breech—knees are bent, but feet are above the baby’s bottom. • Footling breech—feet are below the baby’s bottom. Most medical birth teams will start discussing the scheduling of a c-section after 36 weeks gestation. Typically, it is recommended to have the surgery between 38-40 weeks gestation, but it seems that most doctors choose never to discuss the most natural option: let labor occur naturally. It wasn’t but a few decades ago that all doctors (and midwives) delivered breech babies. It is known as a ‘hands-off’ delivery, meaning the birth team does not assist the baby as it is born. Pulling, tugging, or rotating a breech baby as it is born can cause severe problems, complications, or even end in death. Due to these risks, most doctors today have never even witnessed a breech birth, therefore will not perform one. It is a sad turn of events, as the risk is so little, and is truly only an increased risk when the birth is interfered with. Breech presentation can be the effect of a pregnancy with multiple fetuses, placenta previa, amniotic fluid levels in abnormal range, abnormal pelvic conditions, or just a stubborn baby. It can be easy to learn that your baby is in this position, as kicks are felt in the lower abdomen. An ultrasound will also tell you more exact information. Practice Good Posture: Poor posture can encourage poor fetal positioning. Chiropractic Adjustments: The Webster Technique has a high success rate with encouraging babies to find a more ideal birthing position. Therapeutic Massage: Muscles and tendons control more than one would expect. By using pressure points and massage, the body can be triggered to relax and allow the baby to move easier. External Version: This manipulation is not recommended until after 34 weeks gestation, but most doctors will not perform the technique until 38 weeks, as they want baby’s lungs developed prior to trying to manually ‘flip’ the baby. This technique does not come without risks, as it can cause the placenta to be torn from the uterine wall, bleeding to occur, and immediate delivery of the baby. While rare, these are possible outcomes and make sure you discuss them with your birthing team. Of course, there is always the option of having a vaginal breech birth. Finding a doctor who will perform this delivery may not be easy, but it is not impossible. Several midwives will attend breech deliveries, and it is your right to birth your baby as you please. A hospital may have you sign a waiver that you are going against medical recommendations, but it is your birth. You need to feel comfortable with your birth team and confident in your decisions, no matter what you choose. New mothers often walk in to my practice after giving birth to be adjusted. Pregnancy can do a number on the body, and proper care can aid and speed the healing process once baby arrives. I generally see mothers enter with a heavy infant car seat in one arm and strain across their face. Those car seats are not light, and they only get heavier as baby grows. I love introducing mothers to babywearing and the benefits it can provide for a family. 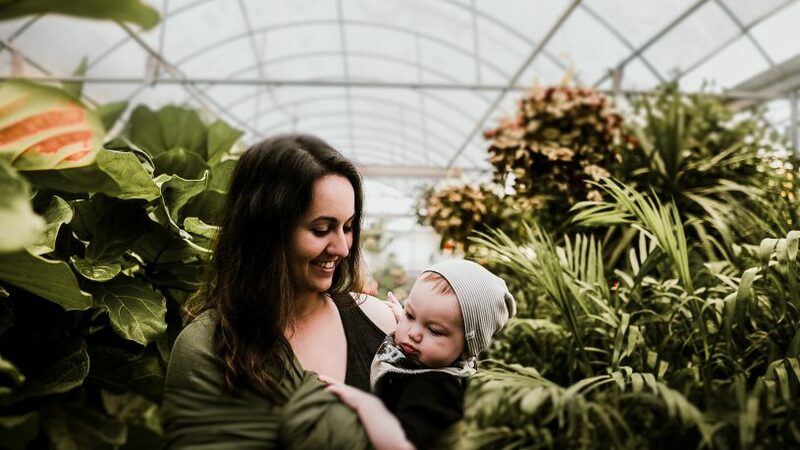 There’s an entire babywearing world out there that can free you from the lugging of a car seat, keep your hands free, and increase your bonding time with baby. From a chiropractic standpoint, I want to stress the importance of choosing a carrier with an ergonomic design. Not all baby carriers are created equal, in all actuality, the most common carriers have come to be known as ‘crotch-danglers’ because they put significant pressure on the pubic bones, forcing the legs to dangle. These carriers also cause excess stress to the wearer’s back and shoulders, making babywearing uncomfortable. I highly recommend joining a babywearing international group in your area and borrowing multiple carriers before purchasing; however, you cannot go wrong with any of the recommendations from the group. Babywearing mimics the movements the baby felt in utero. It is a safe and comfortable place for the baby to be. There is little to no overstimulation due to being worn on the chest and close to the heartbeat. While keeping baby skin-to-skin, or close to Mom’s heartbeat has many benefits, babywearing also gives family members a chance to bond with the baby. Babies learn voices, smells, movements, and faces by being worn. Babywearing helps keep baby happy while also providing two free hands to continue daily tasks. Environmental experiences stimulate nerves to branch out and connect with other nerves, which helps the brain grow and develop. Babywearing helps the baby’s developing brain make the right connections. The baby is closely involved in the mother and father’s world and is exposed to, and participates in, the environmental stimuli that mother selects and is protected from those stimuli that bombard or overload her developing nervous system. She so intimately participates in what mother is doing that her developing brain stores a myriad of experiences, called patterns of behavior. Babywearing also enhances speech development; baby is up at voice and eye level, and he is more involved in conversations. This all adds up to brighter, more alert, more intelligent children. It is very important to understand basic babywearing safety before ever putting on a carrier. As with any baby product, baby carriers can pose potential safety hazards if they are not used carefully and correctly. Always exercise common sense while babywearing. Baby carriers are not an approved child restraint or floatation device and should not be used in moving vehicles or boats. Avoid babywearing in situations where it would not be safe to carry an infant in your arms. As chiropractic care is becoming a more well-known and utilized form of preventative care, it is also drawing in many women throughout their pregnancies. Pregnancy is a time of much discomfort, as the body is changing and causing misalignment and pain for the mother. This is when the term “Webster Technique” begins being tossed around. Over 30 years ago, Larry Webster DC developed the Webster Technique; he also founded the International Chiropractic Pediatric Association (ICPA) to oversee, promote, and ensure the proper chiropractic care of children, pregnant women, and families as wholes. His technique has become known in today’s society as one of the go-to methods of helping a fetus find the best position in utero. The truth is that the Webster Technique addresses sacral subluxation through sacral analysis, diversified adjustment and related soft tissue release. It was found that many women claimed their unborn children turned into a more ideal birthing position after receiving treatment. This intrigued minds and caused a large amount of talk in the research community. According to the ICPA, “The Webster technique is a specific chiropractic analysis and diversified adjustment. The goal of the adjustment is to reduce the effects of subluxation and/or SI joint dysfunction. In so doing neuro-biomechanical function in the sacral/pelvic region is improved. The ICPA recognizes that in a theoretical and clinical framework of the Webster Technique in the care of pregnant women, sacral subluxation may contribute to difficult labor for the mother (i.e., dystocia). Dystocia is caused by inadequate uterine function, pelvic contraction, and baby malpresentation. The correction of sacral subluxation may have a positive effect on all of these causes of dystocia. NOTE: Not all chiropractors are certified in this technique, and I cannot stress the importance of finding one who has completed the ICPA 180-hour certification program to ensure proper utilization. 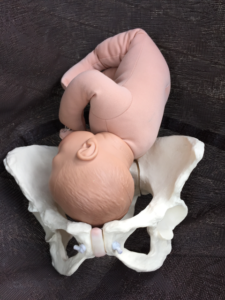 This improperly aligned pelvis can also encourage a baby to settle into the breech position late in pregnancy. Because of these risks, it is important that a chiropractor assess the mother throughout pregnancy and adjust accordingly to aid the body as it changes, which also allows the baby to naturally find its most comfortable and best position to grow and be born from. A properly aligned pelvis and sacrum help the muscles stay loose, allowing the nerves within the pelvic area to send important messages from the nervous system to their proper destinations without interference. The Webster technique does just this; it balances the pelvis properly while reducing stresses to the ligaments that support the uterus. I have many mothers join my practice during pregnancy with the thought that it won’t be needed once baby arrives. I have several others who call for their first appointment shortly after birth begging for relief of new found pains and problems. It doesn’t take either mother long to understand just how valuable chiropractic care is as a standard of care in a healthy lifestyle. I have shared much information about care throughout pregnancy here on the blog and within my book, but I feel as though the topic of postpartum chiropractic care is an extremely important topic within itself. I am not just talking about the week after having your new baby, which of course is highly needed, but also the months – and even years for some – after having children. After giving birth, you may not consider one of your first outings should be to the chiropractor, but once you think about the journey you have accomplished, you may think again. That first visit after birth is wonderful for both mother and baby. Your baby has just experienced quite the ride – no matter how she entered this world. Her positioning within your uterus may or may not have been ideal, the birth process is strenuous, and the world can be a hard place to adjust to. A great family chiropractor is exactly what she needs! I’ll save those details for a future blog, but know that a newborn definitely can and should be seen after birth. Today, though, I want to talk about YOU… the mother. After giving birth, some of these problems disappear while most linger and new ones arise. The body immediately begins working to tighten the ligaments and realign organs and bones, but it is a process. This can take months, even up to a year to completely occur. And while this is happening, you are altering your body by holding a baby, leaning to breastfeed, survive in a state of exhaustion. To put it mildly, your body is not in its peak performance state. Seeing a chiropractor immediately after birth grants you the ability to jump start your body’s healing process. Chiropractic care ensures proper blood flow to these tightening ligaments, aligns the spine to allow proper neuron reception and movement, and can alleviate aches and pains. There are, of course, the most common areas needing adjustment after birth; the pubic bone, sacrum, and lower back. While pregnancy can alter these areas, birth significantly throws them out of place. A good adjustment will ease the body into motherhood with far less pain than a mother who does not get adjusted. Continual chiropractic care throughout the postpartum period speeds the recovery time as a whole, too. If you are planning to have more children, it is even more important to help heal your body properly. Future pregnancies deserve a strong foundation and healthy start. In February (2017), the ACOG released a new committee opinion that common labor and birth interventions should not be used on low-risk pregnancies. If you are currently pregnant and fall into this low-risk category, it is of utmost importance that you educate yourself on these recommendations. It typically takes the medical field years to come up-to-date and follow through reliably. The ACOG recommends that low-risk pregnant women seek individualized care as opposed to common obstetrics practices. These doctors are trained and capable of handling more intricate pregnancies and are quick to intervene when it is not necessary. This is around 6 cm dilated but can be witnessed as a shift in the labor. The mother moves into a more serious role and contractions become stronger and more frequent. Waiting until this time helps prevent an unneeded c-section and other birth interventions (such as pitocin). During this time (and before), a warm bath may help with the pain, as well as relaxation and support. Keep track of the baby’s heartbeat with a hand-held device. Skip the constant fetal monitoring, as research has not proven it to be safe for baby. It is also quite cumbersome and interfering with the natural process of labor. By using a doppler (fetal stethoscope), the risk of having a c-section drops drastically, as does the chance of needing forceps or vacuum to aid baby in being born. Obtain continuous, one-to-one support from a labor companion such as a doula. This shortens labor and reduces the likelihood of cesarean birth, use of pain medications, and increases the probability of a positive birth experience. Drink clear liquids during labor. Not eating or drinking in labor at the hospital is an outdated practice that can potentially spiral labor into interventions. Using an IV does not support the woman’s body in labor to move as needed. It is now recommended to drink plenty of clear liquid and the committee is currently still researching eating as needed while laboring. I can assure you that eating helps keep energy levels where they need to be, and food should be consumed if wanted. Avoid a procedure to break the membranes (bag of waters). Use upright positions and/or move about during labor. Work with gravity during labor. Laying on your back is the opposite of productive. This increases the intensity of contractions and stretches the length of the labor. Choosing to be upright, moving around will shorten labor time and reduce the chance of having a c-section. Try various drug-free pain relief methods. Use position of comfort and choice when pushing and giving birth. As previously stated, lying on the back fights gravity, increases pain, and lengthens labor. This can be said for the second stage – or pushing, as well. There are several positions in which help baby move through the birth canal easier, and even aid in preventing tearing. Hands and knees, squatting (shorten birth canal by over 10%! ), side-lying, or whatever is comfortable for the mother – that is the best position to push. Rest and await the urge to push after full dilation. Couples assume that 10cm means PUSH! The ACOG now recommends waiting to push until the body begins pushing on its own. There is a natural timeframe that the body creates after reaching maximum dilation. This time allows for rest and energy rebuild to effectively aid the body in birthing the baby. Push according to one’s own urges and preferences. Gone are the days with pushing for a count of 10 or bearing down and hold the breath to push as hard as possible. These tactics have been shown to cause possible harm and are no longer recommended. Allowing the woman’s body to be its own guide is now understood to be the best way to birth. Following these recommendations can aid in achieving the birth a mother desires, one with little to no intervention. This is the absolute healthiest way for a baby to enter the world. While pregnant, utilizing a knowledgeable chiropractor can also provide many benefits for mother and baby. I believe that opening your mind to alternative care and exploring additional birth team members can help make the journey of pregnancy and birth a more positive experience. Giving birth is an intense experience in which the body pushes itself, causing stress and pains to the mother that can last well after the baby arrives. Even if no immediate pain is felt, there is still need for chiropractic care during the postpartum period. I often explain to my clients that after having a baby, the body needs time and help to reach its full potential again. So many women complain about things never being the same, or that back, hip, pelvic, or wrist pain intensifies instead of dissipating. Considering all the body has been through during pregnancy: the hips widening, additional weight being carried, a postural shift, hormonal changes, and other ailments, it is easy to understand that the body may be out of alignment. When you then add hours of contractions, pushing, and birth into the equation, it’s clear that one of the first trips out of the house after having your baby should be to the chiropractor. A woman’s pelvic biomechanics can be altered during birth. As the baby descends, especially if he is posterior (sunny-side-up), the bones of the pelvis can shift and become misaligned. Chiropractic care can manipulate the pelvic bones, restoring balance and comfort. • Hormones work to soften the ligaments between the bones in your pelvis which allows for the pelvis to shift, granting additional room for the birth. This can cause soreness in some women. These hormones are not only released to the pelvic region, but the entire body is affected. This means that all ligaments have the opportunity to become looser, weaker, or less effective. This puts you at an increased risk of injury, inflammation, and pain at all joints of the body. These hormones commonly cause instability and abnormal motion of the sacroiliac joint, pubic-symphysis, and other joints that can cause lasting pain. • Baby drops lower into the pelvis, engaging for birth. This shift or drop can cause further stress on the body, as the mother alters her posture to accommodate this extra weight and different position from baby. • Braxton Hicks contractions. These are the body’s way of preparing birth, and they can be both positive and negative. If brought on by dehydration, stress, over-working, or exhaustion, the body will not be working as a whole. Maintaining a healthy diet, proper sleep, and daily exercise should help keep Braxton hicks contractions to a beneficial amount. If birth was difficult or traumatic, the spine and pelvic joints large challenges to overcome. Once the baby has arrived, a mother’s center of gravity is altered drastically, causing her to even walk differently. Her hormones rollercoaster, and her body works toward nourishing the baby. Holding this new baby can shift the posture and strain the wrist, neck, or back. Failure to restore normal biomechanics may result in permanent health problems in need of medical intervention. The jury is still out on exactly how long the hormone relaxin can affect the body postpartum. If it is still present, the ligaments of the body will not completely tighten. Research shows that the ligaments begin to re-tighten nearly 8 weeks after giving birth, but the process’ length can be different for each woman, taking up to a year or more. It is critical to work with a qualified chiropractor before ligaments begin to pull back, as it can cause long-term problems if the joints are not properly aligned. During the postpartum period, chiropractic adjustments speed recovery time, aid the body in normalizing pelvic and spinal positions, and help correct the posture. Seeking chiropractic care within the first two weeks after giving birth may help to prevent headaches, shoulder problems, neck discomfort, muscle tension, lower back pain, sciatica, upper back pain, wrist and elbow pain, and more. The body breaks down carbohydrates into glucose and causes insulin to be released. The insulin pulls the glucose from the blood and transfers it to the cells to be stored for energy. When a woman is pregnant, the body leaves some glucose in the blood so that it can be passed to the baby through the placenta and umbilical cord. Gestational Diabetes effects between 5-9% of pregnancies and typically occurs in the last 20 weeks. As the baby grows, the placenta produces more insulin hormone blockers. This leaves excess insulin in the mother’s body. It has become common practice for every pregnant woman to be tested for gestational diabetes. It is unclear if this is truly necessary to test every woman, but because this condition can effect both mother and baby, women willingly oblige. The American Pregnancy Association currently recommends what is called a “two step approach” for screening for gestational diabetes between 24-28 weeks gestation. The first step is a glucose challenge test (GCT). During the GCT, the woman is given Glucola, a sugar drink, and then has her blood sugar level tested one hour after consuming said drink. If the results are above the normal range, the woman will come back to perform a 3-hour version of the test. This drink should not be recommended for consumption for anyone, especially to a pregnant woman. Glucolift is a natural, non-GMO, artificial colors & flavors free glucose tablet. It’s made for people with type 1 diabetes who need to raise their blood sugar regularly throughout the day. 50 GM Breakfast Meal: this is what I personal suggest, as it lets the body digest and process real food. It can consist of several options, so talk to your birth team or research which you would most prefer. You have the ability to request any of the above options for your test, or the right to refuse the test all together. Sleep is a vital component to health, and it is not uncommon for women to have trouble sleeping during pregnancy. Physical, emotional, and hormonal changes during this time create stress on the body and nervous system, which consequently may make it more difficult for women to fall asleep and sleep soundly at night. A sufficient amount of quality sleep for women is crucial throughout their pregnancy. Studies have found links between women with poor sleeping habits during pregnancy are at higher risk for birth complications such as low birth weight and pre-term births (University of Pittsburgh School of Health Sciences, 2013). An added difficulty is that many conventional sleeping aids are not able to be utilized while pregnant. Luckily, there are several natural and safe remedies that women can utilize during this time in which sleep is crucial for both mom and baby. Vital for promoting and maintaining bone health, vitamin D also plays an important role in neuromuscular functions, immunity, and reduction of inflammation. It is estimated that up to 50% of the general population is deficient in Vitamin D (Lee et al., 2008). Research indicates that insufficient levels of Vitamin D may negatively influence a person’s sleeping habits. A positive correlation was found between those with sufficient levels of Vitamin D in their system and an increase in their sleep quality and quantity (Blumberg et al., 2014). Vitamin D is found naturally in very few food sources; the food sources with the highest amount of Vitamin D are fatty fish such as tuna, mackerel, and salmon. One of the best sources of Vitamin D is through sunlight. Our bodies are able to use the ultraviolet rays from the sunlight to synthesize its own Vitamin D, however, the average person does not receive enough daily sun light exposure to maintain adequate levels. Supplementing Vitamin D daily is often the most effective way of maintaining proper levels. Epsom salts are a naturally occurring mineral, magnesium sulfate, and has several beneficial uses. Magnesium is a natural muscle relaxant and when there is a sufficient amount in the body, it helps to promote production of serotonin, a calming neurotransmitter. When the body is under stress, it is depleted of magnesium, resulting in a decrease in serotonin levels as well. When added to a bath, Epsom salts are absorbed through the porous openings in our skin, soothing our muscles and decreasing stress levels (D.O., 2014). Creating a nightly routine with Epsom salt baths can aid in better and more rested sleep. It is important to use natural Epsom salts without any added perfumes or artificial coloring, as these can be irritants to sensitive skin. If you do not have a bathtub, that’s okay, a foot bath with Epsom salts will do just as much good when it comes to absorbing the magnesium and soothing your nervous system. Aromatherapy has been shown to have many beneficial physical, mental, and emotional effects to those who utilize it. Difficulty in falling asleep and sleeping soundly can often be linked to a nervous system under stress. If the nervous system is not able to relax, then the body and mind will not be able to relax either. Studies have shown that the scent of lavender oil before bedtime, calms the body’s nervous system and puts it in a parasympathetic state (Sayorwan et al., 2012). The parasympathetic nervous system is commonly referred to the “rest and digest” nervous system. When in this state the body’s heart rate slows, blood pressure decreases, and an environment of relaxation is created for the body. Lee, J. H., MD, O’Keefe, J. H., MD, Bell, D., MD, Hensrud, D. D., MD, & Holick, M. F., MD, PhD. (2008 December 9). Vitamin D Deficiency : An Important, Common, and Easily Treatable Cardiovascular Risk Factor? Retrieved January 4, 2017, from http://www.sciencedirect.com/science/article/pii/S0735109708031756. Sayorwan, W., MPham, Siripornpanich, V., MD, Piriyapanyaporn, T., BSc, Kotchabhakdi, N., PhD, Hongratanaworakit, T., & Ruangrungsi, N., PhD. (2012). The Effects of Lavender Oil Inhalation on Emotional States, Autonomic Nervous System, and Brian Electrical Activity. Retrieved January 04, 2017, from https://www.researchgate.net/profile/Tapanee_Hongratanworakit/publication/ 225051306_The_Effects_of_Lavender_Oil_Inhalation_on_Emotional_States_Autonomic_Nervous _System_and_Brain_Electrical_Activity/links/0fcfd51257861db827000000.pdf. 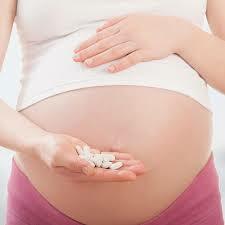 The Truth about Tylenol: Dangers for Infants, Children, and Pregnant Women. “Oxidation” is a normal process in the body that happens when we use oxygen to create energy for the cell. The byproduct of oxidation is the creation of “free radicals” which are unstable molecules. Free radicals are “bad” because they can damage cell DNA, potentially causing permanent mutations. The body uses anti-oxidants to “scavenge” free radicals, neutralizing them so they can’t damage the DNA or any other part of the cell. Glutathione is a sulfur-containing molecule that can absorb the impact of many of these free radicals. Once it absorbs a free-radical it needs to be converted back to the active form. When the body takes a large oxidative “hit” it causes the depletion of active glutathione. The result is lots and lots and lots of oxidative damage. Glutathione is especially important because it is active in the brain, unlike most other antioxidants. Can you imagine what would happen if you deplete glutathione in the brain? You end up with oxidative damage, inflammation and brain injury. So guess what medicine is known for depleting glutathione? You guessed it, acetaminophen (Tylenol). Tylenol has been called into question for decades now, but yet remains to be the last remaining member of the class of drugs known as “aniline analgesics” on the market. Acetaminophen only blocks the feelings of pain and reduces fever, it exerts no anti-inflammatory action. In reality, Tylenol can cross the blood-brain barrier and cause inflammation on the brain, all while masking the symptoms. But Tylenol is Safe, Right? NO. Acetaminophen (known as paracetamol in the UK) is linked to more deaths per year than any other over-the-counter pain reliever. Acetaminophen (sold under the brand name Tylenol, among others) may be among the most dangerous medicines on the market. I’m sure this comes as a surprise to most of you, as virtually every single household keeps a bottle on hand for the occasional ache and pain, and doesn’t think twice about taking it. Not thinking, it turns out, could cost you dearly… Acetaminophen overdose is actually the leading cause for calls to Poison Control Centers across the US—more than 100,000 instances per year—and, each year, is responsible for more than 56,000 emergency room visits, 2,600 hospitalizations, and an estimated 458 deaths due to liver failure. The International Journal of Epidemiology said children born to mothers who took acetaminophen during pregnancy were more likely to have behavior problems and slow motor development at age 3. Another study cited an increased risk of attention deficit hyperactivity disorder, or ADHD, at age 7. Even scarier than this information is that the U.S. Food and Drug Administration rating system for drugs in pregnancy ranks Tylenol safer than ibuprofen, and much safer than aspirin. The truth: There are no “safe” pharmaceuticals to take while pregnant (or at all.) So much is unknown about fetal development, especially in relation to pharmaceutical drugs. Therefore, every mother should do her best to avoid taking any pharmaceuticals. Brain Development while in utero: http://www.ncbi.nlm.nih.gov/pubmed/24566677 Research data suggest that acetaminophen is a hormone disruptor, and abnormal hormonal exposures in pregnancy may influence fetal brain development. The thing that makes Acetaminophen dangerous, especially for children, is that the difference between a “dose” and an “overdose” is fairly small. If twice the recommended daily dose is taken, liver damage can result. That does not give you much margin of error. 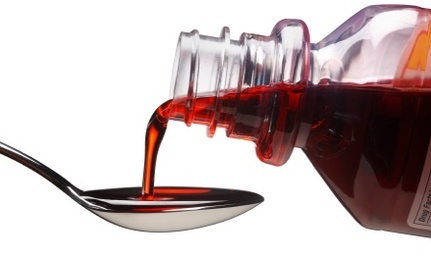 It is very easy to improperly measure Tylenol drops and give your child too much. 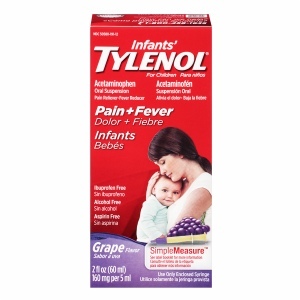 Giving your child the wrong dose of the medicine by mixing up infants’ and children’s Tylenol. If you have several children of different ages and one of them is an infant, this mistake can be extremely easy to make, especially at night. You can accidentally give your child a double dose. One parent gives the child a dose of tylenol, and then the other parent does the same thing 10 minutes later because of lack of communication. You give your child two medicines simultaneously, both of which contain Tylenol/Acetominophen. You drop a Tylenol pill on the floor, your toddler pops it in his/her mouth, and because Tylenol is “safe” you don’t even think about the ramifications. *Note: These can be caused while in utero if the mother takes acetaminophen. Using Tylenol in lowering fevers actually prolongs illness: Studies show aspirin and acetaminophen suppress production of antibodies and increase cold symptoms, with a trend toward longer infectiousness. In a study of children with chickenpox, acetaminophen prolonged itching and the time to scabbing compared to placebo treatment. In test-tube studies, therapeutic levels of medicine suppressed the ability of human white blood cells to destroy bacteria. Another study found that a host of pain relievers, including aspirin, tylenol and ibuprofen, inhibited white-cell production of antibodies by up to 50 percent. ADHD: Exposure to acetaminophen in utero and in infancy, increased both the likelihood of a diagnosis and prescription, and more exposure increased the chances even more. Based on the researchers’ estimates, any exposure to acetaminophen increases the risk of an ADHD prescription by 30 percent. Stevens-Johnson Syndrome (SJS):This reaction begins with flu-like symptoms that progress into a painful purple or red rash that blisters and causes the top layer of your skin to slough off. This can lead to serious infections, blindness, damage to internal organs, permanent skin damage, and even death. Toxic Epidermal Necrolysis (TENS):TENS also typically begins with flu-like symptoms (cough, headache, aches, and fever) and progresses into a blistering rash. Layers of the skin may peel away in sheets, and hair and nails may fall out. TENS is often fatal, typically as a result of infection. Acute Generalized Exanthematous Pustulosis (AGEP):This skin eruption causes numerous pustules to appear on the skin, often accompanied by fever. This condition typically resolves within two weeks once the acetaminophen is stopped. Hyperkinetic Disorders: http://www.ncbi.nlm.nih.gov/pubmed/24566677 Maternal acetaminophen use during pregnancy is associated with a higher risk for HKDs and ADHD-like behaviors in children. A large part of what makes acetaminophen so dangerous is that it’s found in so many products. Please read your labels and understand the possible outcomes of your choices. Remember that adults are at risk for the above mentioned side effects (and others), but today, we are just focusing on the pregnant mother and child. 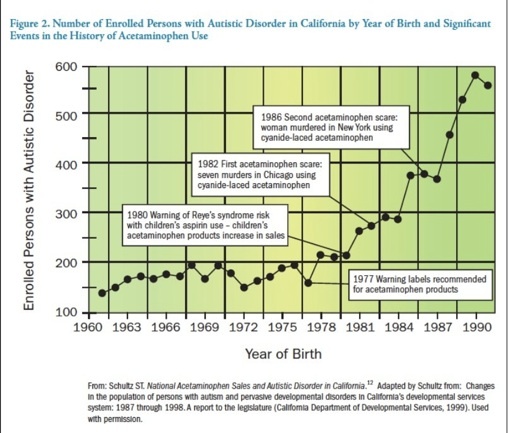 Shaw W. Evidence that increased acetaminophen use in genetically vulnerable children appears to be a major cause of the epidemics of autism, attention deficit with hyperactivity, and asthma. J Restorative Medicine 2013;2:1–16. Deth R (PhD). Personal communication 2010. Hong RW, Rounds JD, Helton SW, Robinson MK, Wilmore DW. 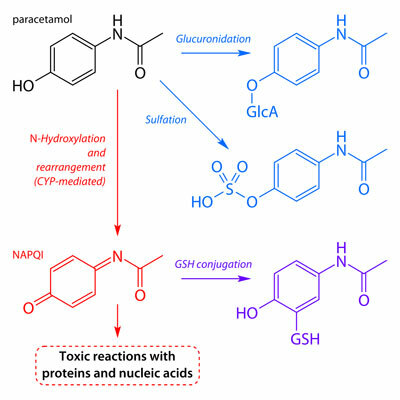 Glutamine preserves liver glutathione after lethal hepatic injury. Ann Surg 1992;215:114–119. Bauer AZ, Kriebel D. Prenatal and perinatal analgesic exposure and autism: an ecological link. Environmental Health 2013;12:41. Dr. Brenda is a miracle worker! Love Dr. Brenda!! She's a miracle worker and has helped my infant son immensely! I recommend her to everyone. Darci O.